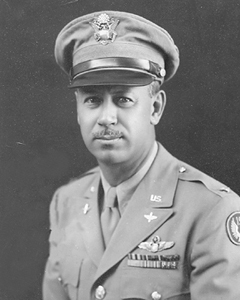 Major General Fay R. Upthegrove was the first Commanding Officer of the 99th Bomb Group. The son of Frank Ellis and Cora Jane Upthegrove, he was born January 28, 1905 at Port Allegany, New York. He graduated from the U.S. Military Academy at West Point in 1927. Upthegrove was appointed a 2nd Lieutenant in the Infantry, but he applied for flying training. He earned his wings in 1928. He married Miss Martha Driscoll on September 6, 1930. Upthegrove's military career spanned three decades and much of the globe, with duty in the Far East, African, and European theaters of operation during World War Two. In April of 1942, he was placed in command of the 99th Bomb Group, taking it overseas in February of 1943. After leaving the 99th BG in November of 1943, Upthegrove was placed in command of the 304th Bomb Wing of the 15th Air Force in Italy. After World War Two, he was base commander of Chanute Field, Illinois; commanding general of the U.S. Air Force in Europe; deputy commander of the 2nd Air Force at Barksdale, Louisiana; and commander of the 20th Air Force at Okinawa. He retired as commander of the Keesler Training Center at Biloxi, Mississippi on July 27, 1957. Upthegrove received the Distinguished Service Medal, Silver Star, Distinguished Flying Cross with oak leaf cluster, Air Medal with 10 oak leaf clusters, Distinguished Unit Citation, and numerous campaign badges. Upthegrove's wife, Marcella, passed away on June 27, 1970. He remarried to J. Elizabeth "Betty" Staley on October 1, 1974 at Bradford, Pennsylvania. Upthegrove passed away on January 8, 1992 at Bradford. Upthegrove had two daughters- Mary Jane Scott of Xenia, Ohio, and Sue Kinch of Gales Ferry, Connecticut.